This service can help provide you with control over any circumstance; financial, romantic or otherwise. ****PLEASE FILL OUT YOUR ORDER FORM WITH THE NAME, PURPOSE AND GOALS OF THIS SERVICE IN THE "SPECIAL INSTRUCTIONS" AREA ON YOUR ORDER FORM BEFORE PAYING. FORMS NOT FILLED OUT WILL RESULT IN CANCELLATION WITHOUT RESCHEDULING. This service is to help restore a previous relationship. 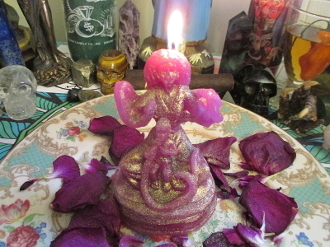 This is a 2-3 day service, depending on candle burn and wax flow, during which I will created a loaded and dressed Lovers candle for you, create a name paper, set the proper offerings and evoke Saint Martha to help you achive your goal.